Step 1 Place peppers on rimmed baking sheet skin-side up. Broil until skin is blackened, 8 to 10 minutes. Wrap in damp paper towels and let sit 5 minutes. Scrape off skin and cut peppers into thin slices; set aside. Step 2 Combine lemon juice, oil, curry, salt and pepper to taste in small mixing bowl. Whisk to combine. Taste and adjust seasonings. Set aside. Step 3Combine flank steak, potatoes, roasted peppers, onions, tomatoes, capers and parsley in large bowl. Toss lightly to combine. Add dressing, toss to mix thoroughly, then serve immediately. In Recipes-list.com we have selected the most viewed recipes from category - Leftovers Salads . Enjoy the best recipes specially selected for you! 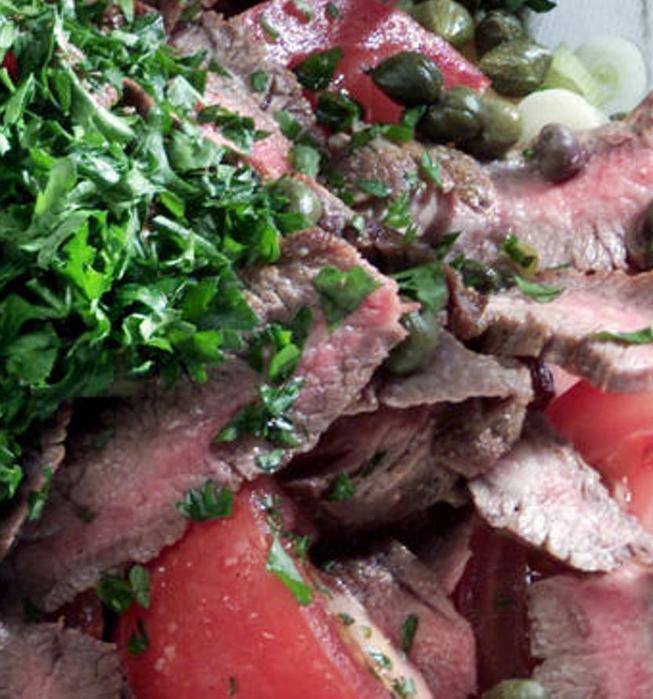 Flank steak, potato and roasted red pepper salad is the right choice that will satisfy all your claims.